British MPs will on Wednesday hold votes on various Brexit options even as Prime Minister Theresa May comes under pressure to announce a departure plan to get support for her unpopular divorce deal, AFP reported. 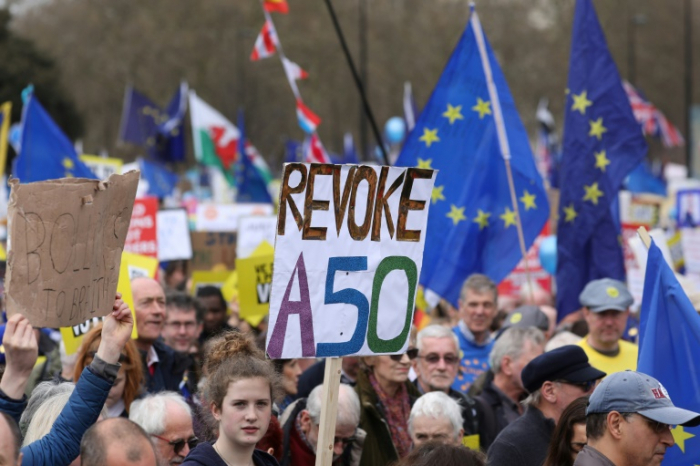 Three years after a referendum in which Britain voted to leave the European Union, the country is gripped by painful uncertainty over how -- or even whether -- it should put an end to its 46-year membership. May's deal negotiated with Brussels has already been voted down overwhelmingly by parliament twice but the government is widely expected to present it for a third time on Thursday to ensure an orderly Brexit. In a bid to find Brexit alternatives, lawmakers took the unprecedented step on Monday of seizing control of Wednesday's parliamentary business. MPs will hold a series of "indicative votes" -- indicating their preferences on a piece of paper -- for different Brexit outcomes, although May is not legally-bound to follow their instructions. The proposals put forward so include a customs union with the EU, remaining in the single market, holding a second referendum or stopping Brexit by revoking Article 50 -- the formal notification for departure. Parliament's unprecedented power-grab was spearheaded by arch-EU MPs, who want to either reverse Brexit or preserve much closer economic ties with the remaining 27 states. Three members of May's government quit in order to vote for the move, further piling pressure on their leader. "If the Prime Minister announces a timetable of departure, I think that's going to swing a lot of people behind her deal, we could get it over the line," said Conservative MP Nigel Evans. The group's Brexit spokesman Sammy Wilson said the party would rather see a one-year Brexit delay. "Even if we are forced into a one-year extension, we at least would have a say on the things which affect us during that time and would have the right to unilaterally decide to leave at the end of that one-year," he wrote in the Daily Telegraph. "We won't let the PM or the Remainer horde in parliament bully us into backing a toxic Brexit," he said. It has already been written into international law and is expected to pass easily, with May's office saying that "there would be uncertainty for citizens and businesses" if MPs were to reject it. A group of Brexit-supporting MPs however has said that holding the vote after the delay had already entered international law "created serious legal doubts about the legal situation surrounding the extension".